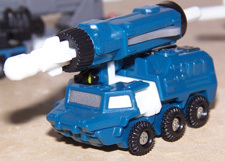 Other appearances: The Night Attack Team made no appearances in the TF Armada stories, much less in any other facet of the TF Universe. 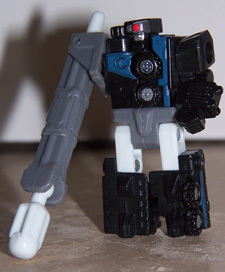 Their was a G1 Autobot Triple-Changer with the name Broadside, but he's clearly different individual with the same name. 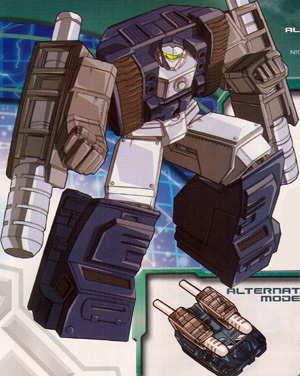 I cannot recall any other characters named Fetch and Scattor among TFs..
Bio, Abilities... text below is taken from the awesome Dreamwave comic, TF: Armada, MTMTE #1. W/ its other great original character art, we recommend you buy yourself a copy today! Bio: It's like looking into a mirror. A dirty, cracked, ugly-makin' mirror. Yeah, Broadside and his unit got a lot In common with us. 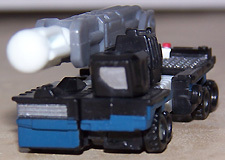 They're warrior Mini-Cons who are unaligned with any faction, not to mention the fact that they were built to be pretty much our physical doubles. But this Broadside scraplet is nothing like me, and don't you forget it. He's , a cruel, pretentious shell of a 'bot who's always spouting off half-brained verses about "darkness this, shadows that:' Whatever. He'd better stick to the darkness, all right, 'cause if I ever catch sight of him on the battlefieid there isn't gonna be too much left of him. Weapons and Abilities: Okay, so Broadside's not exactly a punk in the strength department, and he's a crafty fighter when he's got darkness on his side. He's also got super-hard armor plating, and a main weapon that's pretty much the equal of mine. 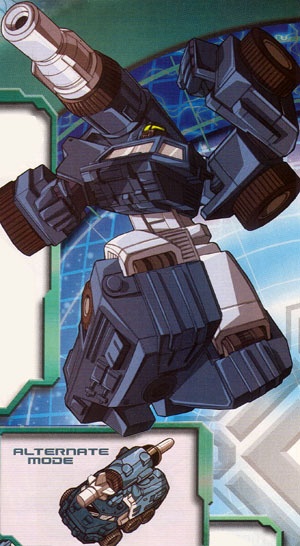 His shoulder cannon can fire powerful energy blasts or an anti-personnel missile that's effective up to 5 miles in robot mode and 8 miles in vehicle mode. 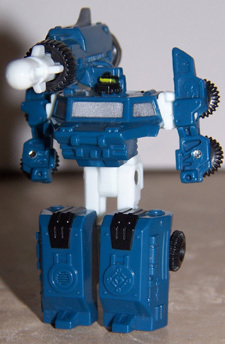 Weaknesses: I hate to say it, but Broadside doesn't have too many real weaknesses. Unless you count that face of his-ugh! Bio: Scattor leads the battle-hardened unit of malcontent Mini-Cons known as the Night Attack Team with a cold confidence. They've personally fought in and won more battles than most armies have, so he's not worried about the team's ability to function under fire. Scattor has no doubt that those with the biggest guns will win the day, and he's equally sure that his team has those guns. Like their counterparts on the Land Military Team, the Night Attack trio has kept from joining officially with any group. However, it's no secret that the fiendish Scattor, who's wanted for war crimes throughout the galaxy, readily identifies with the cruel Decepticon ideology of might making right. He has even considered joining them, if only for added protection in case any survivors of the NightAttackTeam's cosmic wrongdoing ever return to claim vengeance on Scattor. Should the Night Attack unit join with the Decepticons, their strength could tip the balance of power decidedly against the Autobots. Weapons and Abilities: Subject is a physically powerful Mini-Con as well as an experienced battlefield commander. He has fought on every imaginable terrain under every imaginable condition, giving him unmatched military training. His right arm is a large cannon that can fire a variable payload warhead. Subject's weapon of choice is a multiple-missile warhead that launches nine independently targeted, heat-seeking projectiles at multiple targets. 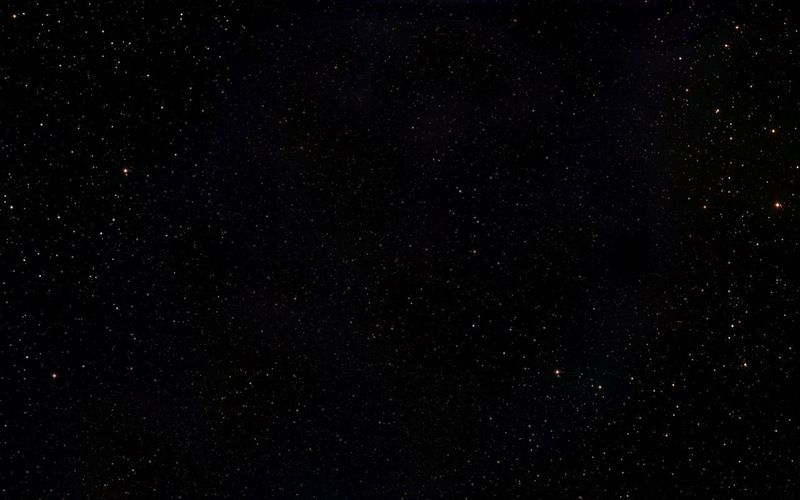 Weaknesses: His single optic sensor is designed primarily for night vision, making it vulnerable to bursts of light. Light based attacks can disorient or render him temporarily blind. "What, you think you can take me?" BIO: Fetch's motto is essentialiy his response to anything that someone. might have to say to him. If someone asks a question that seems even remotely derogatory, Fetch bristles immediately and starts caliing for a fight. Most people aren't prepared for Fetch's hair-trigger temper, much to the amusement of Broadside and Scattor. The other members of the Night Attack Team do little to discourage this behavior, and actually egg Fetch on in these circumstances. They eagerly employ their favorite tactic: suggesting that some hapless, clueless Mini-Con talk to Fetch "aboUt his self-esteem problem:' This gives them something to joke about and usually spelis disaster for the object of Fetch's aggressive attentions. Fetch's foul disposition is indicative of his team's nature, so it's no surprise that they lean toward the Decepticon side of the war as much as the Land Military Team leans toward the Autobots. Weapons and Abilities: Subject has exceptional strength and stamina for a Mini-Con, but only average intelligence. 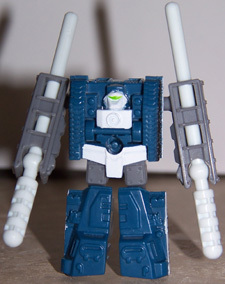 He is armed with two identical arm-mounted rocket launchers. Each can fire a self-targeting warhead with a variable payload; Subject likes to load each cannon with different ordnances so he can provide "a little variety for my victims:' He specializes in night attacks and stealth combat operations. Weaknesses: No amount of training or experience seems to be able to dull Subject's irrational and dangerous temper, which is his greatest weakness. !